Car Key Replacement Harlow by Access Denied, offers car key replacement for all makes of vehicles. We have great delight in carrying out our work and have a mobile setup including all the equipment needed for car key replacement. Choose Access Denied, Harlow & Auto Locksmith Services. 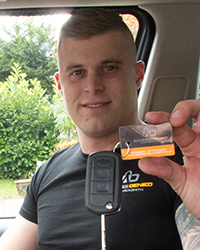 Our mobile car key cutting service is on call 24 hours a day, so you never have to worry about losing your keys – we will have you mobile in moments! We provide an auto-locksmith service so that you can gain access to your car, even when your keys have been locked inside – we conduct this so entry is damage-free! Our mobile car-key programming service means you will have a fully synchronised key programmed for you at the roadside – mobilising you with ease wherever you are! Why should you choose Access Denied? If you have mislaid your car keys, then Access Denied can supply Car Key Replacements in Harlow. Our team can replace keys – even if you don’t have any of the originals! We carry parts on board for almost all makes of vehicle. We also have a mobile work-station to allow key-cutting & programming in Harlow. We come to you, so you can continue with your journey freely. Access Denied has an up-to-date on the road work station. Our facilities allow us to provide road side support with 24/7 emergency cover in Harlow. This covers all of our services from Key Cutting to Auto Locksmith work. Our high quality facilities allow us to be with you and supporting you within 30 minutes of a call. The team carry everything required for all types of cars, so you won’t be waiting around! FORD, VAUXHALL, VOLKSWAGEN, PEUGEOT, RENAULT, TOYOTA, BMW, NISSAN, MERCEDES, CITROEN, AUDI, HONDA, FIAT, LAND ROVER, HYUNDAI, SKODA, MAZDA, MINI, KIA, VOLVO, SEAT, SUZUKI, MITSUBISHI, JAGUAR, ROVER, SAAB, LEXUS, CHEVROLET, MG, PORSCHE and many more, so call us if your vehicle make isn’t here. Not so long ago getting replacement car keys cut was a straightforward affair. But now car keys have all sorts of components built-in to handle the extra functions: central locking, alarms, immobilisers etc. Having the knowledge of where to get a car key replacement in Harlow is critical, and not just for lost car keys. There’s getting spare keys cut and programmed to match your car, so that you have spares just in case you lose them. Then there’s changing the batteries, transponder chips and even buttons and cases too. That’s not all. After years of use buttons eventually stop working, some manufacturers being worse than others. A good car key replacement company will be able to get the correct type of key fob and transfer the electronics and battery from your old key. Water damage is also a problem. An old key would have shrugged water off but with electronics and batteries in modern car keys, water can ruin them.Sometimes you might be able to dry the key out, but the key is not always salvageable. The moisture will still be around the metal components and the miniature circuit board. Eventually oxidization will eat away at the contacts and tracks on the boards and the car key will fail. So if you have accidentally dropped your key into water, it’s well worth arranging a trip to a car key replacement company in Harlow to get some spares before your original set stops working! If your car key has actually broken, make sure you keep all the parts. If it’s broken off in the lock, then a reputable car key replacement firm will extract the metal part but they will need the plastic shell and the parts inside it to use in your new key. It can be done without those parts but it will take longer and cost more, so try and keep all the parts you can. We promise the best price for car key replacement. We believe we are the most cost effective option, and will beat any other locksmiths in your local area on price and customer service. Please contact us about car key replacement Harlow. At Access Denied we provide full car key copying. If you need your Car Key Duplicated in Harlow we can use your current keys and create new ones. We can also provide full programming of new keys if you would like them synchronised to the car. We offer standard keys as a lower cost solution if you just want a back-up without the programming. In the event of damaged keys we are still able to make duplicates or replace them. Perhaps you just want a spare key for peace of mind, or for another family member. Access Denied car key duplication service can help you. If your car key requires reprogramming in Harlow, we have a qualified team of specialist engineers that can assist you. In a lot of cases, the key fob tends to be damaged but we can easily replace these. We can also make several car keys whilst we work on your vehicle. Call us now and give us your car details and we can discuss options with you. Needing a car locksmith isn’t something you ever plan for, but instead is needed whenever an emergency occurs. When something does go wrong with your car, you want to find a fast and helpful auto locksmith in Harlow who is able to fix the issue, and get your car back up and running as soon as possible. Luckily, that’s where we come in. – Keys locked inside the car. A common issue is an inability to access your car due to highly advanced locking technology, designed to keep burglars out. However, we have invested in state of the art car locksmith equipment, which allows us to deal with all manner of issues, regardless of the make and model of the vehicle. Amongst other common problems, we are able to cut you new keys, deal with transponder key reprogramming, and fix any faulty locks. Rest assured that, regardless of your problem, our customer-friendly team has the experience needed to get you back on the road in no time. The problem with locking issues on your car is that they can happen at any time of the day, and when you least expect it. That is why we make ourselves available 365 days of the year and 24 hours a day. We currently cover all of Harlow and offer a call out service to your home, place of work, or side of the road if you are broken down. Having issues accessing your vehicle is a very stressful experience, but rest assured that, by getting in contact today, we can have your problem resolved sooner than you thought possible. If you have an emergency and need fast help, then it’s best to give us a call. Alternatively, if your query is less urgent, then you can email us. Need an auto locksmith in Harlow? We are the guys for the job! Or even still, when you’ve been away on holiday, and suddenly your fingers are all thumbs. Right before your eyes – as if in slow motion – your keys slip out of your hands and disappear down the drain you hadn’t even noticed til that second. Unsurprisingly perhaps, about a third of us lose our car keys each year, while another 1 in 20 have them stolen. Modern car keys aren’t as straightforward as the keys you use to lock your front door. It’s best to make sure you get a trained professional on the job – someone who is local to Harlow and can help you out quickly. Locking your keys in the car is a huge stress and it can delay your entire day. This is why we sympathise with any of our customers who find themselves facing this dilemma. However, it can’t always be avoided. In fact, it’s one of our most popular reasons for an automotive locksmith call out. Whether your child accidentally locked the keys in or you simply forgot to take them out, sometimes locking car keys in the car happens. Luckily, it’s a problem that’s easily solved. If you find your keys locked in your car in Harlow and you’re not sure what to do, we’re able to help. The entire process of realising your keys are inside of the car and you’re outside of the car, with no way to retrieve them, can cause a lot of stress. However, there are steps you can take to ensure the problem is quickly solved. Check to see whether you have a space key. At Access Denied we also recommend that you have a spare car key, for times like this. Whether your keys are locked in or you’ve simply misplaced them, a spare key could save the day. Check to see if there are any other ways to access the car. Though we don’t recommend breaking into the car yourself, it’s always a good idea to check to see if the boot is open. Contact a professional automotive locksmith. With top of the range equipment and all of the necessary tools, we’re able to let you in quickly and without causing any damage to the vehicle. As you can see, there’s no reason to worry when you lock your keys in the car. If you don’t have a spare, we’re on hand to help. Based in Harlow, we’re able to offer help when your keys locked in the car. Whether it’s an accident or you’ve got a naughty toddler who caused the problem, it can be fixed in no time. To find out more or to contact one of our professionals, get in touch. Contact us today on 07534 277020 or online. As well as car key replacement, Harlow residents are likely to also want a new fob and a replacement transponder key if the car is made after 1995. A transponder chip is embedded in the key to deactivate the immobiliser system and enable the car to start. Without this, you would not be able to drive the car anywhere. Modern cars all come with electronic central locking, making it easy to quickly open and shut a car, or just the boot if needed. Transponder keys – specifically programmed to each car, remote car keys, key fobs, and standard car keys can all be replaced by an auto locksmith for most types of vehicles with the right information. You just need to make sure you have the following information to hand: the make and model of your vehicle, registration, vehicle identification number, and personal identification with a photo and address to prove that you own the car. In the event that your car key is damaged, Access Denied will be able to help you! Some of the issues we provide services for include: Snapped Key/s, Damaged Key Fob, Keys Broken in Locks, Jammed Car Keys, and Jammed Ignitions. Get in touch with us regarding your specific issue and our staff members will provide the right options for you. All of our work is fully insured and guaranteed, so you can repair your keys and have peace of mind that the work will be to the highest standard. Access Denied Car Locksmith Harlow use the safest forms of non-destructive entry to your car to ensure high quality repairs with no damage. We only use quality approved products and will only carry out work that’s necessary.